The Gaboon Viper is certainly the fattest and probably the heaviest of African poisonous snakes: specimens more than 5 feet long with a body diameter of almost 6 inches have been reported to weigh nearly 18 pounds. Vipers of this size would have fangs well over an inch long and inject something like a teaspoon of venom. While its venom is, drop for drop, much less toxic than that of many other snakes, the sheer quantity as well as the size of the teeth and the depth to which the venom is injected are likely to send the victim into shock and there are reports of death within 15 minutes. 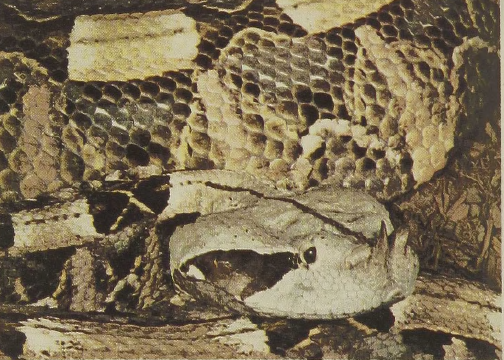 Actually the Gaboon Viper is a most inoffensive forest snake. Its beautiful camouflage hides it among leaf litter as it waits near rodent trails for its prey, which is captured with a very quick but short sideways strike. Gaboon Vipers give birth to more than 50 living young that are immediately able to fend for themselves.